Saw one in Babcock while filing in day 366. I think it was this one, could have been the multi. Just like old times. retrieved from homemade container in Connecticut. Will be returning home to Florida and will drop it near Fort Lauderdale. Moved to GC54WXC-Hunter Island TB Hotel (visit link) "So long and thanks for all the fish!" Found in our own cache, Flowers Peak. Will move soon. Grabbed this little guy during the 2014 Geocaching Block Party. Hey we found this little guy. We will keep him moving for you. As of today he has now visited 3 of the oldest caches in the eastern states. Will have to upload photos when we get home. Found it and will move today! Found it at Eastern Point Light House (Anna'sFace) in Gloucester MA. Took and left a plastic dinosaur and a heart shaped polished stone. Thanks for the find,it's a great idea. I will be moving this to another spot. Spotted in Peaceful Trail cache in Stewart State Forest. Took pic and left for the next cacher. What a neat idea. My friend, GaskillWACO is taking this one to the Niagara Falls area and will place it in a cache in her area. Thanks for the fun!! Stuck here too long. Moving on. We will keep it moving. Discovered in a cache in Selkirk, NY. Cute little fish :) Will move it along! I actually just realized I had this in my possession. I had been out removing some archived caches late last year with the owners permission, and this happened to be in one of them. 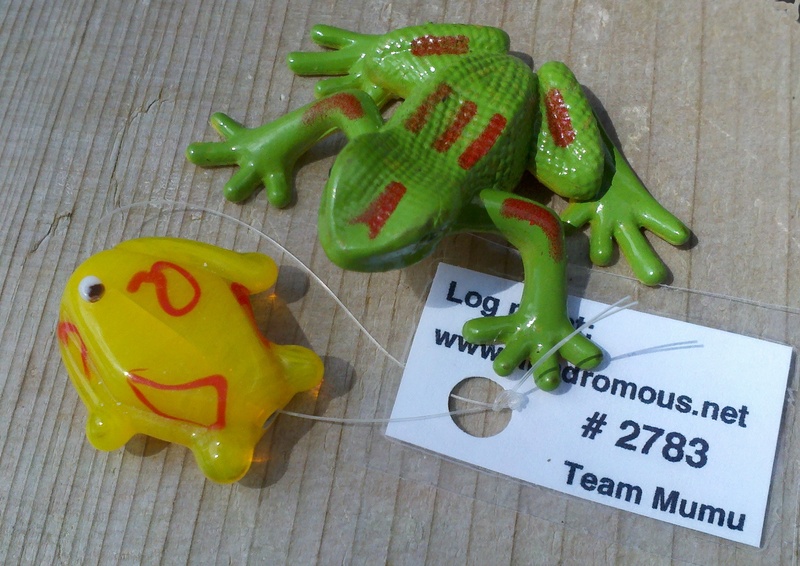 I hadn't looked much at the content of those caches and they had just been sitting in my basement until I was looking through them for swag to put in some of my new caches and came across #2833. This little fishy swam away from Cat Fish. Picked this up last October when we were on a trip to New England. It is now on the Isle of Lewis in Scotland and I am trying to figure out whether to hold onto it or place it in another cache for onward travel. Sadly a lot of travelbugs in caches here go missing. Well, I think this has been stuck in this cache for long enough. love these little fish, been a while since we saw one. We got this one today from the "You're seeing things" cache during the Picnic Back in Peekskill event. We brought it home to northern Connecticut, where we will place it into a cache soon. Thanks! Found in a cache in western ct. I picked this up from Blue Driving in Blue Mountain. Found this one on 8/1/14 in its original drop point, a puzzle cache in Blue Mountain. I almost ran into Ripemous that day. Spotted this finny fella in the Couch Cache and put him in my creel for a trip to Connecticut! We found this cutie little Mumu fish in The Pineapple Cache! We will take her with us while caching and try to find her her next temporary cache lodging until she travels again. I will update when and where we drop her off. We picked up this cute fry from event in Hartsdale Station on August 27, 2014. Thanks to Team Mumu! Thanks for a great tradition! I've enjoyed finding and sharing these jewels. It was fun to find this cute fish in Ushusia! I didn't take, just discovered! I discovered this fish inside the Westchester County Parks and Preserve Challenge when doing an unexpected maintenance stop. Took from "Between Rock & Hard Place" on April 3, 2015. Very beautiful and a brilliant idea! It was nice to meet you at the Southfield event. Thank you for stopping in at my cache "Gone Fishin'". Safe travels! Retrieved from Dewey about a month ago. I'm always happy to find a mumufish, especially in an unusual cache like this one. Dropped off a TB and retrieved Green Fish 2876 from Perkys. Found fish token at BB&B (GC4RV5T). We're so excited, it's our 1st token and sam peep's 1st day. We started at Walmart and kept going up Rte. 23. We'll place it somewhere new! I picked this up from a cache today while enjoying a 4.8 mile hike in Graham Hills. I picked this up from a cache in Graham Hills today. Left it behind, I see someone already found it and is moving it on. Picked up at red and blue makes purple. Will try to move him. I picked this up at Keeblers Future HQ.